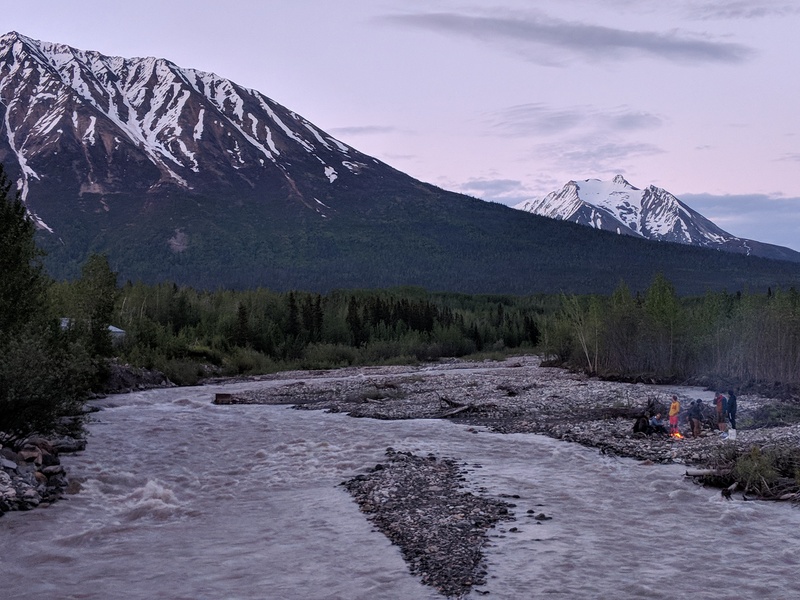 This past June, I had the opportunity to hang out with a bunch of awesome students, professors, and scientists in McCarthy, Alaska for the International Summer School in Glaciology. 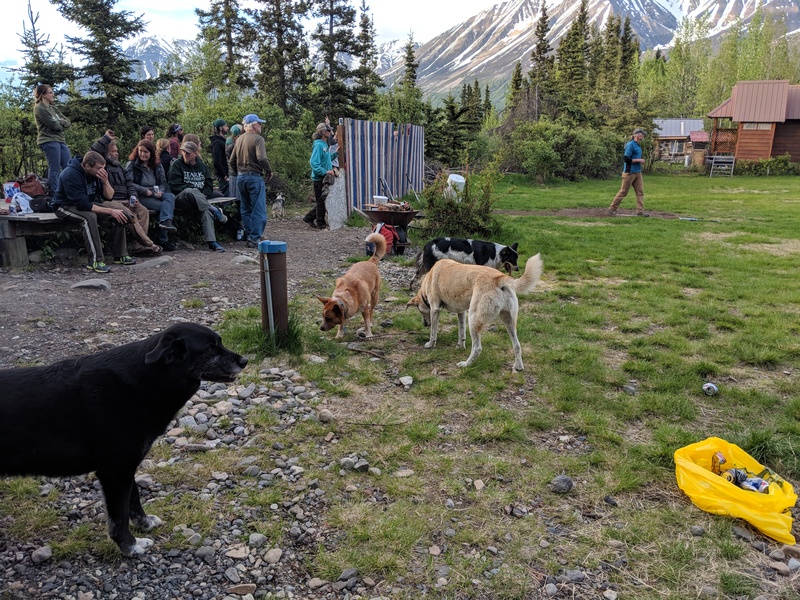 It was a ten-day wild ride of lectures, projects, field excursions, dogs, delicious food, and rapidly-forming friendships. 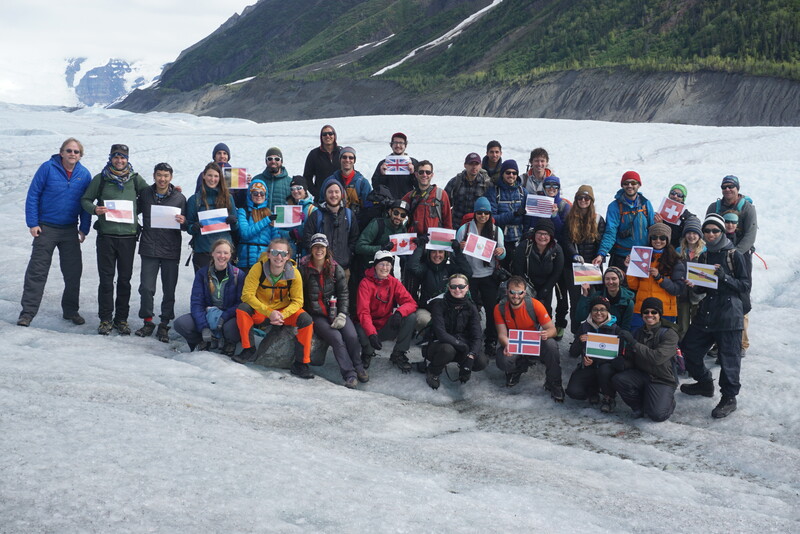 28 students — half from the U.S., half from other countries across the globe — met at the University of Alaska, Fairbanks (UAF) for the class. A few people had met briefly at a conference or event in the past, but generally speaking, we were all strangers to each other, brought together to learn from some of the top glaciologists in the field today. 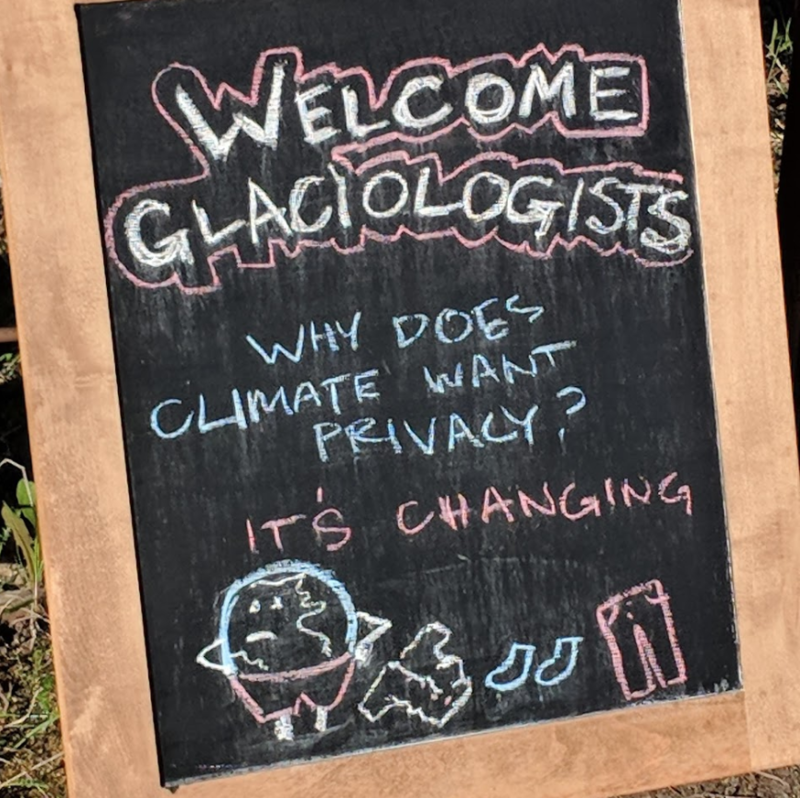 Most of us had just started graduate school, were just getting into the nitty-gritty details of true glaciology, and were looking to gain some of that sweet, icy knowledge. Little icicles in a world full of giant glaciers. We began our journey with a 10 hour drive from Fairbanks to McCarthy. The views were absolutely incredible and it was SO NICE to see some mountains after being in Texas for a year. Driving through Alaska is a treat all on its own. General location of McCarthy (Red Star). 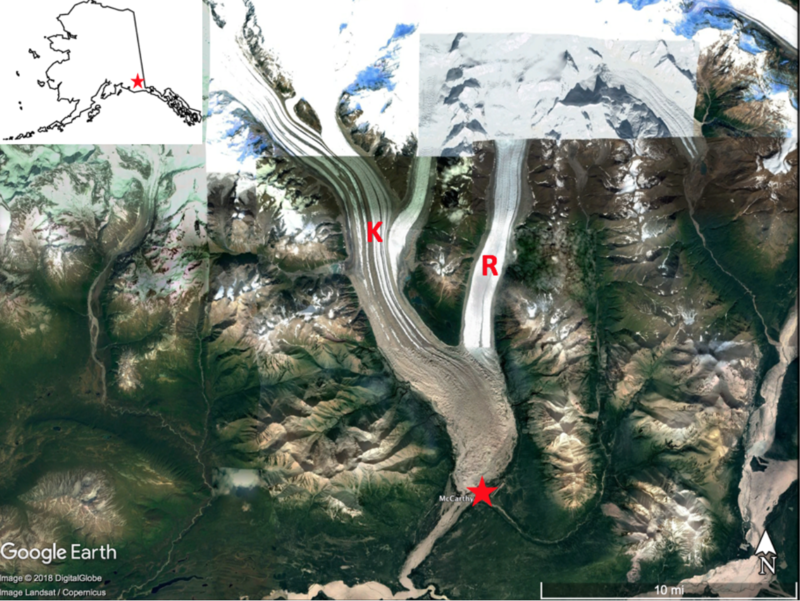 Kennicott (K) and Root (R) glaciers just to the north! Image created from a Landsat and Digitalglobe mosaics from Google Earth. Now, there are plenty of cool towns and cities in Alaska, like Fairbanks, Anchorage, and Seward. I got to visit some of them after the class and loved every minute of it. However, no town is more “Alaska” than McCarthy. McCarthy is situated inside of the Wrangell–St. Elias National Park and Preserve and the people who live in that town are no joke. The students stayed in a nearby campground (“tent city”). The weather was near perfect while we were there this summer (65 F/18 C) and the sun never set. But, in the winter it becomes bitter cold and dark. You need some strong mental prowess to live up here! The locals were very friendly and happy to share their stories. 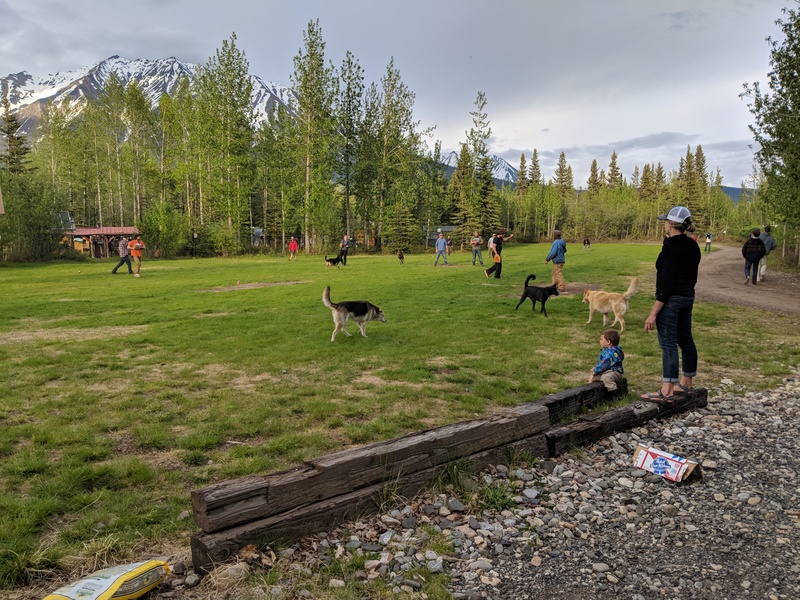 They were excited to have so many students here to learn about a subject their lives were intimately intertwined with up there in the mountains of Alaska. They invited us to play a game of softball with them, and a few students participated in the open mic nights at the local pub. But the best part of McCarthy were the dogs, for sure. Happy, healthy, beautiful dogs. They were everywhere! It was great. Dogs! MVPs of the softball game. The school itself was pretty neat. 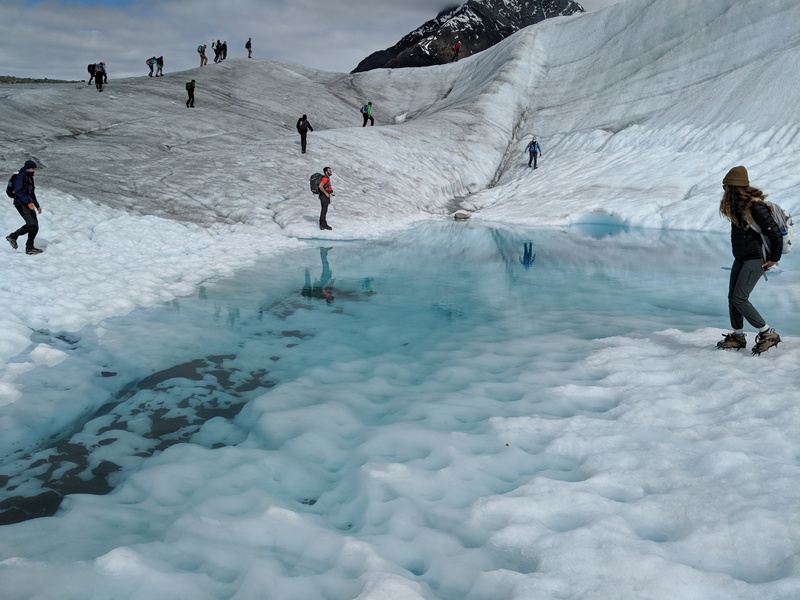 The professors from UAF, as well as a few scientists from other institutions (NASA, USGS, and the Los Alamos National Lab), gave lectures on topics like satellite data, how to measure glacier changes, and the geology of the landscapes that glaciers create. They basically had to teach us major topics in glaciology in as much depth as possible in 10 days. No easy feat, but they made it happen. In addition to the lectures and some exercises, we worked on “mini” research projects with a partner and an instructor. The projects were focused on topics our instructors were experts in. It’s truly amazing how much we were able to accomplish by the end of the school. My partner and I worked on a project where we tried to better understand some surging glaciers in Alaska by looking at how their velocity changed over the past few years. Others worked on problems using modeling or different remote sensing techniques. We even had a mini-conference at the end were we all gave talks on the work we had done. 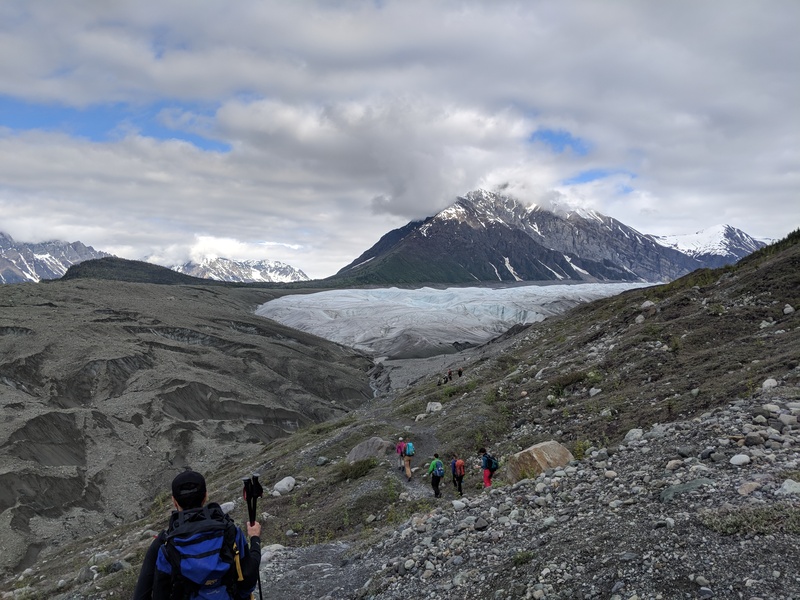 McCarthy is only a few miles from Kennicott and Root glaciers, so a big highlight of the school is the glacier excursion day. 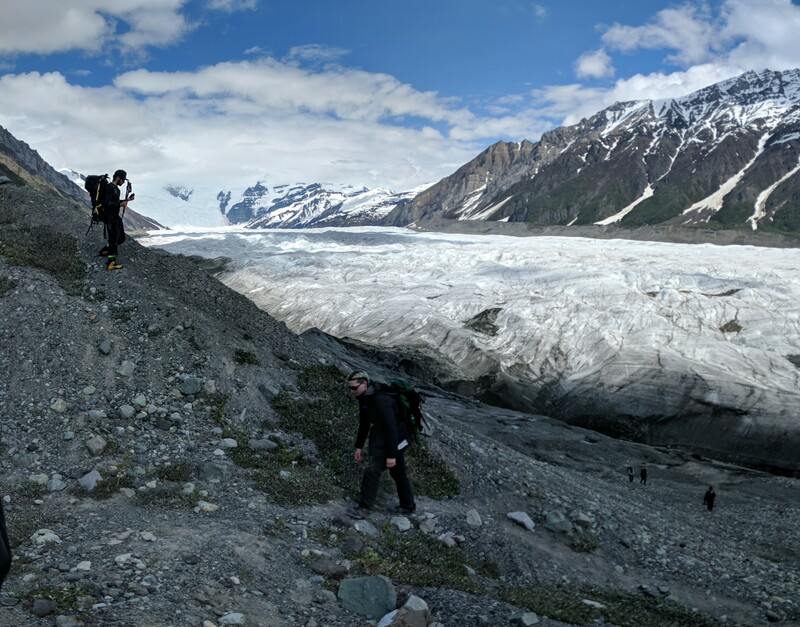 The group went out to Root Glacier and we hiked along some glacial moraines (big piles of rocks pushed along by a glacier as it advances, and left behind as it retreats) up to the toe of Root glacier. Hiking up a lateral moraine. Check out the ice falls in the back, just barely peeking out from the clouds. Alaska was a beautiful place and I learned so much more about glaciers than I could have imagined, but the best part of the class was the people that I met. Networking with the professors and scientists was an amazing opportunity and it was a privilege to soak up some of the knowledge they poured out. It was incredible meeting my peers with whom I will be working on real-life problems for the rest of my academic career and who I consider to be some of my greatest friends. And let me tell you, the next generation of glaciologists are pretty rad. Students and instructors from all over the globe! I may be a Texan now, but Alaska has my heart. If you’re an aspiring glaciologist or just want to learn more about the class, check out the summer school’s website. It’s got all the relevant course info, as well as reports from previous years!